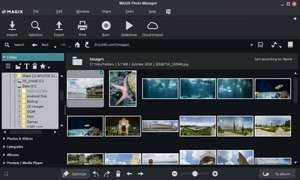 MAGIX Photo Manager is a kind of assistant tool for amateur photographs; it allows the users to grab their digital photos and organize them on the PC. In fact, MAGIX does very well at handling a large amount of photos. For management, MAGIX Photo Manager has many tricks in store. The program can manage photos from portable external disks, photo archives and categorized them into categories which the user must create themselves. Version 13.1.1.4 is a freeware program which does not have restrictions and it's free so it doesn't cost anything. For security reasons, you should also check out the MAGIX Photo Manager download at LO4D.com which includes virus and malware tests. Additional screenshots of this application download may be available, too.